Do you ever have times where ideas just pop into your head on a regular basis and it turns into a creative whirlwind? That’s the way I’ve been lately! 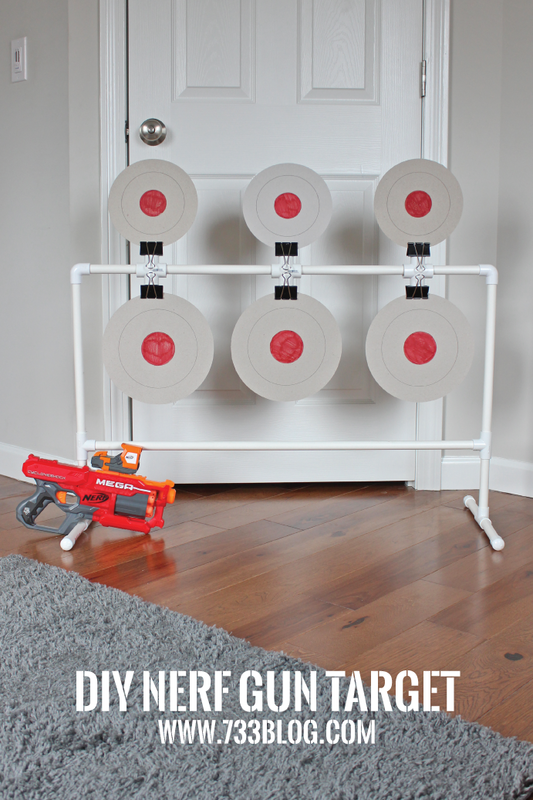 I don’t even know why I started day dreaming about targets – may have been while I was watching my son at Archery, but I got this great idea to create an epic Nerf Spinning Target and I couldn’t get it done fast enough! 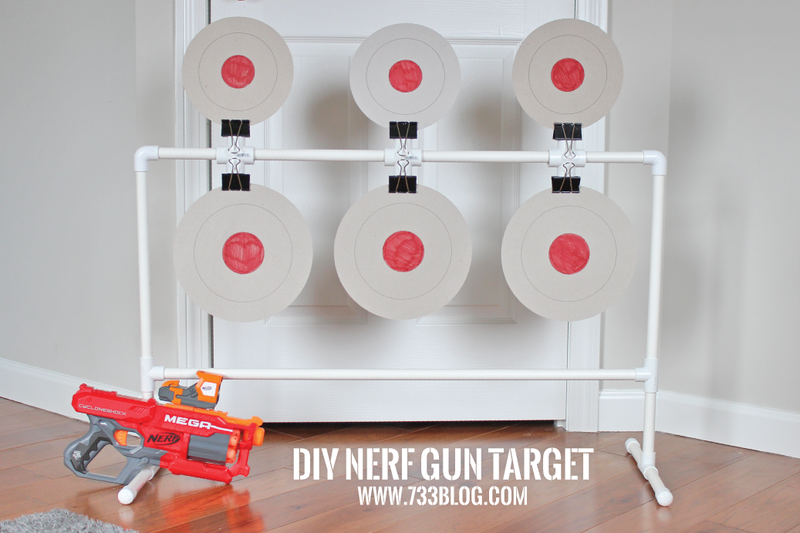 I knew I wanted to make it out of PVC piping, because it is cheap and easy to work with. I wasn’t sure how I would make the targets spin, but I figured I could work it out once I was in the store and looking at what I had for options. Before heading to Lowe’s, I sketched out a design for the target frame. I decided I wanted it to be 3′ wide and 18″ tall. Once I had the frame, I figured out what I needed for connectors and I headed to the store. Once I got home and we did a little testing, the target worked as well as I imagined and now I’m going to share the plans with you so you can make someone’s day a little brighter with a fun gift! Total cost for this was $22. If you already have PVC laying around you’re golden. If you need to buy a pipe cutter to cut the pipes, you’re looking at anywhere from an addition $6-$11. My 8 year old son helped me build this whole thing – we had a great time working on this together, so I definitely recommend letting your child help! Start by creating the feet – take 2 6″ sections and connect them together using a tee connector. Add end caps to the ends of the 2 6″ sections. Repeat for the other foot. Add a 6″ section into the top of the tee connector. Repeat for other foot. Add a tee connector to the top of the 6″ sections. Add a 36″ section in the horizontal slot of the tee connector – connect to the other side. Now you’re frame is taking shape! Add the 15″ sections to the top of the tee connectors. Add the elbow connectors to the top of the 15″ sections. Add the three cross connectors onto the last 36″ section. Add the 36″ section to connect the two elbow pieces, completeing the frame. Make sure all of the joints are pushed in and fitting nice and tight. I made our targets using chipboard and my Cricut Explore. The bottom targets are 10″, the top are 8″. The machine cut the circles and drew the inner circles and I colored the bullseye red. We also used round Tupperware Container Lids, so if you have extras laying around, totally give them a try! I ended up using large binder clips to attach my targets to the frame. I had some other ideas in mind, but felt this would work best. It took a little trial and error with different glues, but this is what I found worked best. Using Gorilla Glue Super Glue (it’s important it’s the super glue! We tried regular Gorilla Glue and it didn’t work – neither does hot glue! ), attach a binder clip to the bottom of the cross connectors. Firmly hold in place for 60 seconds. Repeat for the top of the cross connector. Repeat for the two other cross connectors. I would let the glue set over night before adding the targets (if you really don’t want to wait, then make sure the targets are already IN the binder clips when you attach them, that way you don’t have to squeeze the binder clips open, which usually causes an issue if the glue isn’t fully set!). That’s it! You’re ready to play! We had so much fun playing with this target. My son, hubby and I had a mini tournament and there was lots of trash talk and laughter. We found the Mega Nerf guns work the best because they have a lot of power to really get the targets moving – they CAN spin around, though they usually just wobble back and forth – enough to tell you the target was hit. The other guns worked fine as well. I’m thinking of building something similar, though doing it out of wood, so that we have a nice BB Gun target for this summer. I’m afraid the PVC would cause a ricochet otherwise we’d just use this one. I don’t know who would love this more: my brother or my husband!! How fun! What a great idea, love the storage solution too!! Thanks! We’ve been having fun playing with it! And that storage has been a life saver! This is such an amazing idea! How come I never thought of it! 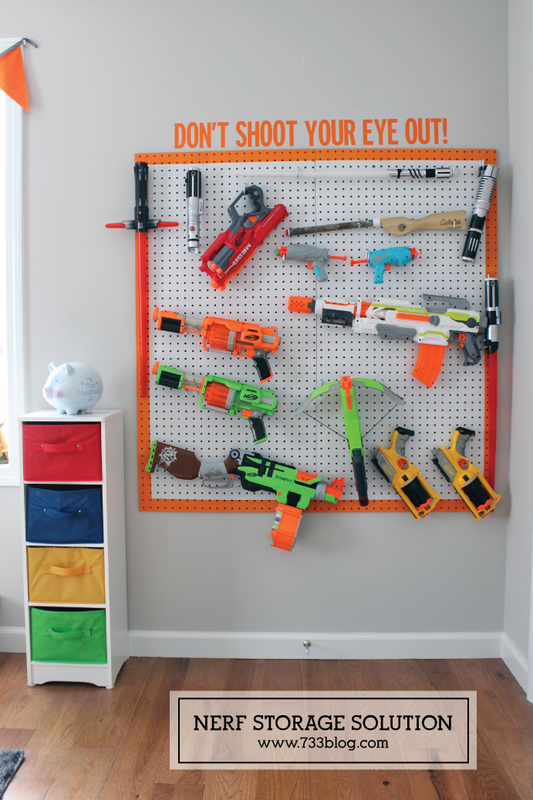 The kids will definitely love it, especially my oldest, he’s just obsessed with nerf guns. Thank you so much! Great Idea. Made one for the grandkids for Christmas. Had some trouble with the adhesives also so got flat top plugs for the cross pieces and then drilled a hole in the center of each plug head and in the center of the binder clip. Used 8-32 truss head screws and nylock nuts to attach the binders to the plugs then inserted the plug/binder pieces in the cross pieces. I don’t have a Cricut which would made things much easier so I used plastic lids and painted bulls eyes on them. Thanks very much for the inspiration! Sounds like you came up with the perfect solution! I did get the adhesives to work (and they’re still going strong!) but it did take a bit of manipulation on my part. I hope your grandkids enjoy their gift! I’m sure they’ll have lots of fun with it, I know my son and his friends sure have. Wishing you a very Merry Christmas!! I’m not sure how you got it to spin. Could you explain? I’m not sure how to explain it more so than in the post. I glued the binder clips to the cross connectors that then were fitted over the top rail. I clipped cardboard circles to the binder clips. When the gun hits the target, it spins (or if not hit hard enough it rocks back and forth). This is perfect. Making 1 for our annual spring fair and 1 with my son for his room. Also love your storage idea. Yay! I hope all the kids enjoy it! Hi! I love this tutorial. 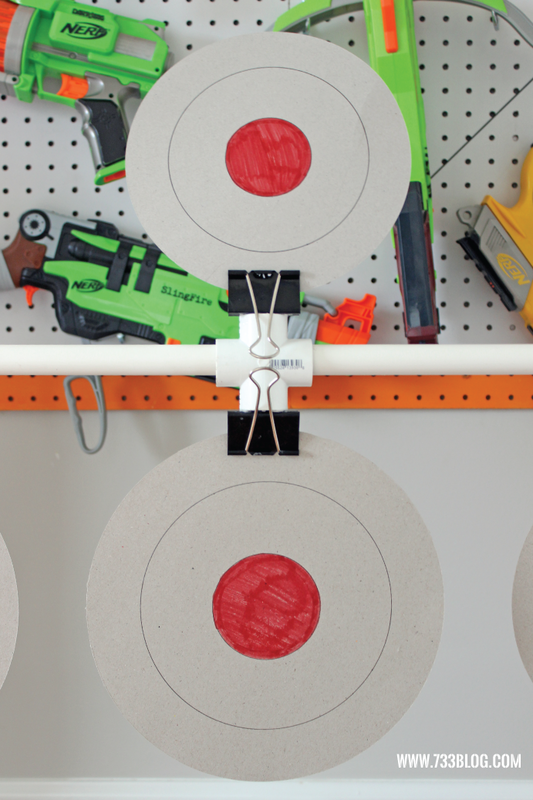 I have a question about attaching the targets. How are the binder clips attached? Are they seated directly on top of the cross connectors where the bottom of the black part is glued to the connector? Or is one of the “legs” glued to the inside of the connector? If it is the former, what size clips did you use. I have large binder clips but they are not as wide as the diameter of the cross connector so squeezing them after they are glued down wouldn’t work… Thank you for your insight! They are large binder clips and they are glued to the connected via the bottom of the block part. We don’t really squeeze them hard to open them – just enough to slip in the sheet of cardstock – you can even get it into the seam without squeezing if you worked at it.